Two of the finest Italian violin makers of the 19th century were Giovanni Francesco Pressenda and Alexandre D’Espine. 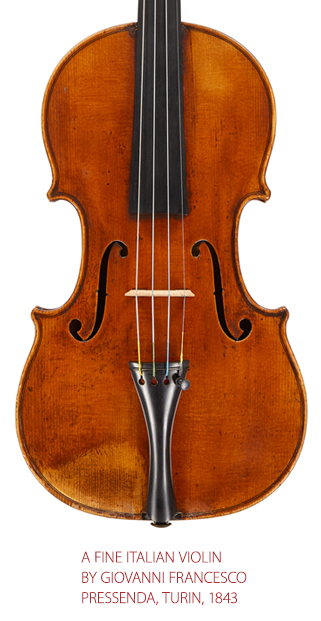 While living as contemporaries and even as neighbors, they were quite distinct in their approaches to their crafts, and yet they developed similar styles and reputations in the violin world as a whole. Pressenda, the son of an itinerant farm worker, was born in the countryside in 1777. He neither trained in Cremona nor was highly educated. He was, however, highly talented and shrewd about opportunities. 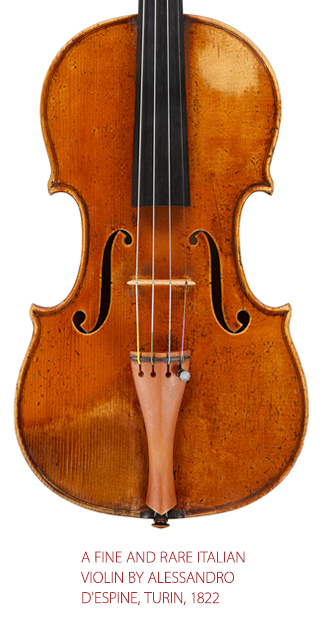 He commenced violin making only after his arrival in Turin in the 1810s, working for Nicolas Lete-Pillement, a merchant entrepreneur with far-flung business ventures. When Lete-Pillement died in 1819, Pressenda, the only Italian on staff, stepped into the breach and took over the enterprise. His imagination and acumen made him, by 1829, the finest and most acclaimed luthier of his day. D’Espine, on the other hand, was from an old Savoyard noble family. Born near Geneva in 1782, he trained as a dentist in Paris, coming to Turin around 1815. His fascination with violin making developed around that time. In 1823 D’Espine was appointed Surgeon Dentist to His Majesty, a title he retained until 1831. In 1829, still sporadically making violins, he entered an exposition, where he was described as a pupil of Pressenda. From this grew a legend of his having been one of the great figures, and from that grew a lot of misunderstanding about the nature of his work. Pressenda developed his own patterns, based largely on the standard Mirecourt Stradivari model, but imbued them with his own personal touches in the f-holes, scroll, varnish, edging and purfling. His ‘f’s, a hybrid Stradivari–Guarneri style, are particularly inspired. He always made his work unique and instantly recognizable. His employees’ own work almost always lacks that special Pressenda character. D’Espine, on the other hand, made up in technical skill what he lacked in experience, for he no doubt had little time for his hobby. As with other makers of few instruments, his art always defies exact categorization. His style never entirely convinces as he had probably never finalized his ideas. This experimentation has led to major misunderstandings about his work. They are always beautifully crafted and acoustically fine, but his variability has made his name a depository for many nameless Turin works. The 1843 Pressenda is an excellent example of the maker in his final decades. Its model, with its distinctive f-holes and black edging on corners and scroll, its scroll of relatively small proportions, its splendid and eye-catching woods, and its rich red varnish speak volumes about why players have gravitated towards his violins for almost two centuries. D’Espine’s 1823 violin, on the other hand, starts from a similar place but comes to very different ends. Impeccably neat and precise, it has a more rigid and rectangular style, notable in the broad pegbox with narrow volutes, the upright stance of both ‘f’s and scroll, and the broad upper bouts, which in lesser hands would be stiff and ordinary. He too used fine woods, and his varnish is a bit lighter and thinner in character – perhaps a sign that Gaetano Guadagnini II was still assisting him in varnishing. Both makers used external forms, making pinning superfluous, but there is a big difference between the way they adopted this Cremonese technique. Pressenda’s were large and inserted after the purfling was set; note how the purfling itself has bent around it. D’Espine’s, on the other hand, are tiny, centered, and set well in from the purfling, an echo, rather than an expression, of Cremona’s tradition.